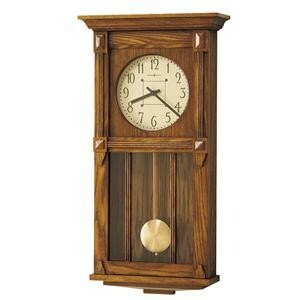 The cream dial on this wall clock features dark brown numerals and hands. Decorative, wooden moldings frame the dial. Circular brushed brass pendulum is antiqued and framed with wooden, reeded grilles. 32-1/2" x 16-3/4" x 6"